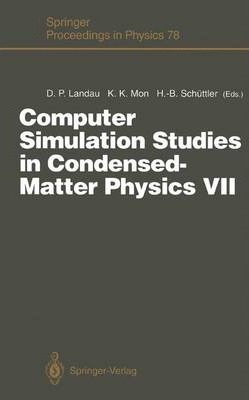 Computer Simulation Studies in Condensed-Matter Physics VII provides a broad overview of recent developments. Presented at the recent workshop, it contains the invited and contributed papers which describe new physical results, simulational techniques and ways of interpreting simulational data. Both classical and quantum systems are discussed. Computer Simulation Studies in Condensed-Matter Physics: An Introduction.- I Classical Systems.- Complexity in Rayleigh-Benard Convection.- Numerical Zero-Temperature Results for the 3d Edwards-Anderson Ising Spin Glass.- Recent Developments in Monte-Carlo Simulations of First-Order Phase Transitions.- Statistical Dependence and Related Topics.- Dynamical Scaling of the Island-Size Distribution and Percolation in Submonolayer Molecular Beam Epitaxy.- Computer Simulation of the Structure Factor.- II Quantum Systems.- The DensityrMatrix Renormalization Group for Fermion Systems.- Simulation of the Electron-Phonon Interaction in Infinite Dimensions.- Excitation Spectra in the 1-D Hubbard Model from Quantum-Monte-Carlo Simulations.- Simulating 2d Fermions in Strong Magnetic Fields.- III Computer Security.- Computer Security in Scientific and Administrative Environments.- IV Contributed Papers.- Monte Carlo with Absorbing Markov Chains: A Faster Monte-Carlo Algorithm for Dynamical Studies.- Non-Arrhenius Conductivity in a Driven System of Interacting Lattice Gas.- Non-Equilibrium Steady States of Ising Systems.- Fourier-Accelerated Polymer Dynamics.- A Multicanonical Study of Non-Polar Amino Acids.- Classical and Quantum Two-Dimensional Fluids in the Gibbs Ensemble.- Optimization by Multicanonical Annealing and the Traveling-Salesman Problem.- Numerical Studies of Metastability in Ising Systems: Short-Range versus Long-Range Interactions.- Study of Frustrated Systems via Dissipative Maps.- Representation of Relaxation Phenomena by Lattice-Gas Models.- Some Monte-Carlo Studies of the Ising Model.- Decoupled-Cell Quantum Monte Carlo: How Should We Calculate the Energy?.- Computer Study of a d = 2 Mixed Ising Ferrimagnet.- Computational Studies of Organolithium Compounds.- Index of Contributors.